Review: This should be a short and sweet review, but that’s appropriate considering a trip to Benny Blanco’s can be very brief. There is no atmosphere to speak of at this tiny, Capital Hill, counter joint. All there is to Benny Blanco’s is a kitchen with a small counter one step from the front door. You just walk in, place your order, and get out. If you order a whole pie during the day, you can go next door and shop for music at Wax Trax while it cooks. There is a TV mounted on the wall, but I get the feeling that is more for the benefit of the pizza makers behind the counter. Benny Blanco’s pizza tastes pretty good, but there are a couple factors that can kick the ranking a little higher. 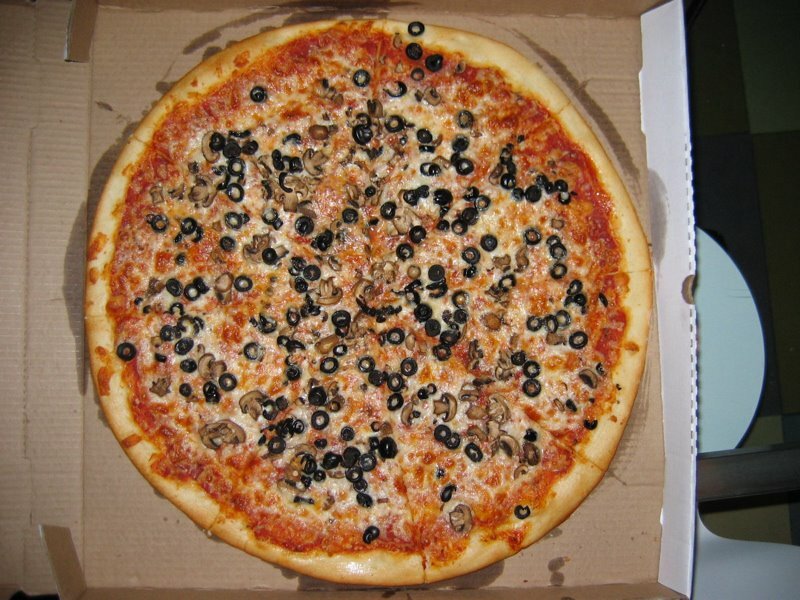 The first is that the medium sized za is 18″ while their large is a whopping 20″. As far as I know right now, this is the largest in town since Papa Keno’s left town and took their mammoth 26″ pizza with them. The second plus is that they are open and delivering till midnight Sunday and Monday, and till 3am the rest of the week. As a good New York-style pizza should be, the crust is pretty thin and the larger slices fold nicely. 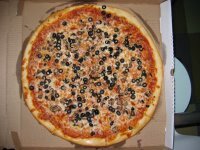 The toppings seem fresh and spread evenly and in a decent quantity, while the sauce-to-cheese ratio was quite nice. Everything had a good flavor to it, although the sauce seemed to slightly edge on the salty side. Without the benefit of any seating, whole pies must be carried out or delivered, so slight cooling is expected. A Benny Blanco’s pie remains quite tasty as the heat diminishes. In summary, this is good NY-style pizza that graduates to great when you have a craving to satisfy after that late-night concert on Colfax. A couple weeks ago a friend and I tried ordering Benny Blanco’s around 2AM on a Friday night. The key word being “tried.” Multiple calls but no answer. I tried calling tonight (a Sunday) around 11PM and got no answer. Since I’m only a block away, I walked over to see what’s up. They hadn’t locked up yet, but said they were swamped all night and closing early. Just a heads up. They’ve got great pizza but the customer service is a bit lacking. Good to know. Thanks a lot for the input. Abo’s now has the largest pie in town with their 24″ “Lunker” pie. Benny Blanco’s RARELY answers their phone after 1:30 even though they are ostensibly open until 3:00. The pizza is yummy… but twice now I have paid with a credit card and twice they have taken the liberty of adding a “tip” on to my credit card transaction without my consent ($3.50 tip on a single cheese pizza I picked-up myself each time!!) and this AFTER I already left a couple bucks in the counter-top tip jar. The first time I thought it was a simple mistake and let it slide as it’s a small, locally-owed establishment and I’m not one to stir the s***. After the second time, it’s obvious there is something shady going on here. CROOKS. If you go, pay cash.